Earlier at night, an all-female edition of Ditdit-dada-dit, our interdisciplinary dinner (four performances, three courses). Spill Gold is a psychedelic band that unwinds vivid, spiralling stories with their eerie yet persistent songs, bringing listeners into a trance-like state. With snake-charming synths, dreamy yet urgent vocals, swerving guitar lines, and heavy, earthquaking drums, they move you to dance and float away at the same time. Spill Gold invites you to lean in to your unrelenting visions and pour out the best you’ve got, streaming and unrestrained. Let it out and get drenched bathing in it. After the concert, be ready to dive into an orange psychedelic haze, and dance until your feet hurt. 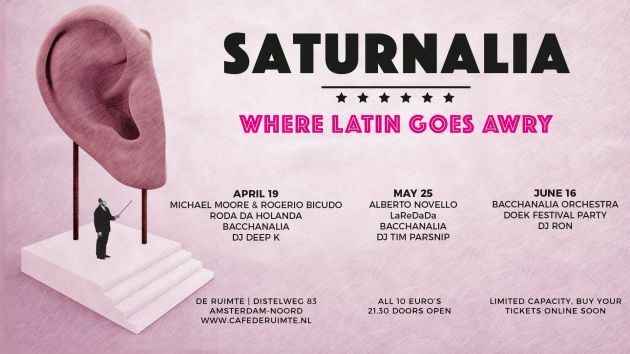 "Alberto Novello + La ReDaDaDa + Bacchanalia + DJ Tim Parsnip"
SATURNALIA: where Latin goes Awry. Alberto Novello a.k.a. 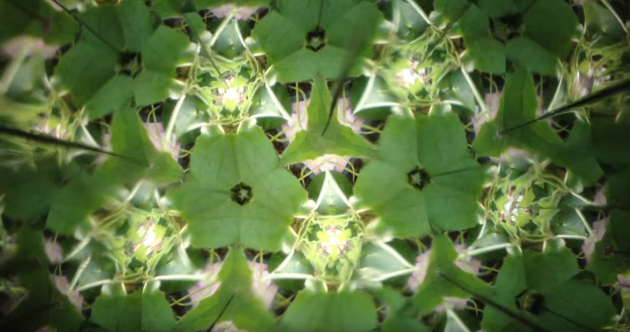 JesterN is an Italian scientist, composer, multimedia artist. His main artistic focus is directed towards the creation of probabilistic multi-media architectures, on the technological limit between instability and error, failure and expression. Lately he moved from digital systems to analog found or decontextualized electronic ensembles. La Redada, a sextet of tropical psychedelic music from the capital of Mexico consisting of Carlos Icaza, Julian Huerta, Daniel Llermaly, Oscar Ojeda, Feike de Jong and Fernando Caridi, references Latin American from the 30's to the 70's, reinventing sounds hidden in crates of second hand vinyl. La Redada takes these songs with the goal of revisiting an imaginary past of the Mexico City, where musical adventure, the energy of dance and the variety of human experience contained in this city of 20 million people reigns. noise, electronic music and tropical music among others. Sometimes the most foolish combinations are excellent. A golden cocktail: repeating cumbia rhythms as a basis for explosive jazz strapping. The six-headed Bacchanalia, led by Uruguayan bass player Miguel Petruccelli, made concert halls, cafés, stages and tents sweat and explode. It is the mesmerizing Spanish African rhythms and the roughly exploding lashes of saxophone, guitar and percussion that make up the entire band sound like a fire-breathing monster. After the three live acts, Tim Sprangers will take out his huge collection of tropical, funky, and straight up swingin' vinyl. Saturnalia was an ancient Roman festival in honour of the god Saturn. The holiday was celebrated with a sacrifice at the Temple of Saturn, and a public banquet, followed by private gift-giving, continual partying, and a carnival atmosphere that overturned Roman social norms: gambling was permitted, and masters provided table service for their slaves. A common custom was the election of a "King of the Saturnalia", who would give orders to people and preside over the merrymaking. The poet Catullus called it "the best of days". This series was made possible with help by the Amsterdams Fonds voor de Kunst. De eTickets voor "De Ruimte" worden verwerkt door TicketView.nl | copyright © 2019. TicketView is NIET aansprakelijk voor de planning, uitvoering én organistatie van het evenement waarvoor u via onze ticketing-service tickets heeft gekocht. Verdere contacten over uw eTickets verlopen ALTIJD via "De Ruimte".